And his “October surprise” will do little the change the election’s fundamentals. Frenzy ensued. Donald Trump immediately embraced the bureau he had once excoriated; Clinton surrogates attacked Comey directly. The New York Post called it the “stroking gun.” “Could Anthony Weiner’s E-Mails Cost Hillary Her Job?” asked the ever-hyperbolic Larry Kudlow. Livid Democrats Kremlin-baited, with former DNC chair Howard Dean tweeting that Comey, a Republican, “put himself on the same side as Putin.” Senate minority leader Harry Reid charged that Comey had “explosive information” about “coordination” between Donald Trump and “the Russian government” but hadn’t acted on it. Moreover, Comey dropped the bombshell while admitting that he had no idea what the e-mails contained. 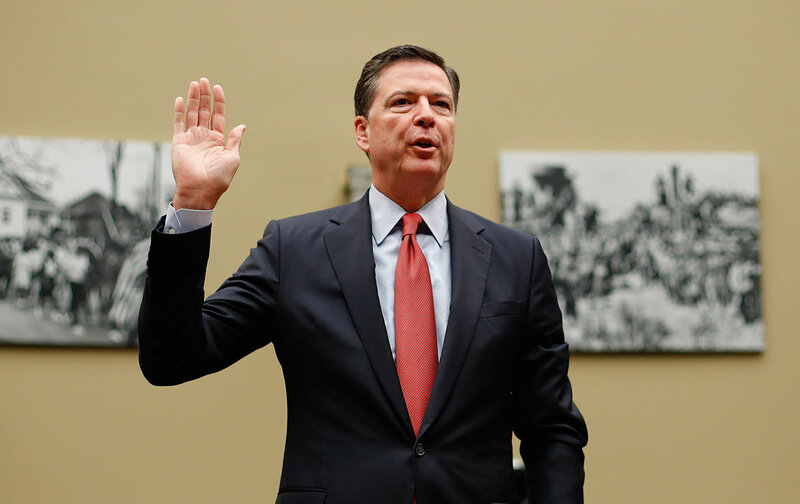 This indefensible abuse compounded his original sin of publicly declaring that the FBI investigation of Clinton’s e-mails had been completed and that “no reasonable prosecutor” would bring a case against her. The decision to prosecute or not is made by the prosecutors at the DOJ, not by the FBI director or his investigators. Comey clearly holds himself in high self-regard and has an unquenchable thirst for the spotlight, but he was out of line then and is out of line now. Republicans rightly howled then; Democrats are right to object now. Perhaps both might agree that Comey should be fired as soon as the election is over and shunned for shaming his office. More brouhaha about Hillary’s e-mails isn’t going to change this election. The overwhelming percentage of people who actually vote have already made up their minds about the character of Clinton and Trump, and as we go to press, some 22 million have already voted. As Bernie Sanders memorably put it, this election isn’t about Clinton’s “damn e-mails.” These candidates give voters a stark choice. Trump promises more tax cuts for the rich and more deregulation. Clinton pledges tax hikes on the rich to invest in rebuilding America. Trump has said he opposes raising the minimum wage; Clinton favors it. Trump thinks global warming is a hoax invented by the Chinese; Clinton sees that it is a clear and present danger. Trump has no clue about student debt; Clinton pledges debt-free public college. Trump promises to build a wall and ship millions out of the country; Clinton wants comprehensive immigration reform that will bring the undocumented out of the shadows. Trump wants Supreme Court judges that will protect the Second Amendment and repeal a woman’s right to choose; Clinton wants justices that will overturn Citizens United, curbing the role of secret corporate money in our elections. These two candidates would lead America in very different directions. Those differences are far more important to the vast majority of voters than how Clinton dealt with her e-mails. Comey pulled out a dirty trick in his October surprise. But in the end it will be a sideshow, doing more to discredit him and the FBI than to influence the results of the election.